Gypsies, who played for the best dance in the city at the millennuum night, are now set to roll again in the month of January a series of concerts in the provinces and a couple of foreign tours. They will be in action in Kandy at the Dharmarajah College Hall on January 14. According to Sunil, Gypsies will perform in full swing including Corrine ,Ronnie, Menike and with all their acts at this Kandy Show. 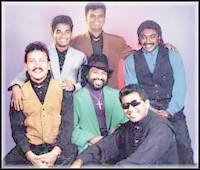 On January 15 the band will be in action in Anuradhapura and on 16 , they will be in Panadura. Gypsies will perform in Senthosa Island in Singapore on January 21 and followed by a tour in Dubai, UAE. "These overseas tours will feature all our acts ,dancers and artistes" said Sunil. Meanwhile Gypsies will be in full swing at Moratuwa Stadium on January 29 , when they will perform at the Mega Snack Party with the cream of local talent in aid of the St Sebastian's College . Rajni Kanth's Muthu which became a hit when screened in India and Sri Lanka last year is just now running to crowded houses in two theatres in Kiboya, Japan. In one theatre it has passed the 23rd week mark and the other theatre in the suburbs of Kiboya has just opened out. In Kiboya it is learnt that super star Rajni Kanth's blockbuster has already netted in Rs.13 Crores for the 23 weeks. In the suburban theatre it is just pouring in. In certain parts of Japan Rajni Kanth has become the matinee idol. Another of his films another blockbuster Thalapathi is awaiting release in Japan. Popular compere and television personality Kumar de Silva (of "Bonsoir" and "Fanclub" fame) had the unique opportunity of wishing radio listeners in France in Sinhala, just as the New Year dawned here in Sri Lanka. It all happened when "NRJ" (pronounced 'energy'), a leading French radio station called him up and wanted him to do a live link-up with its station in Paris. Our guy readily agreed and it was all set in motion. And so on 31st night, as Kumar was compering at the California Grill, the fine dining restaurant of the Galadari Hotel in Colombo, on his handphone, came the call from Paris. He was interviewed for over a minute during which time he spoke about celebrations at the Galadari Hotel, the fabulous view he had of the Swarnavahini show on the Galle Face Green and finally ended up by wishing French listeners in Sinhala. Kumar was in fact one of several "NRJ" correspondents around the world who linked up from their respective countries at midnight. Among them New Zealand, the Fiji Islands, Japan, Hong Kong, Thailand, the Maldives, the Reunion Islands, Kenya, Finland etc. The interview took place at 7.00 p.m. Paris time, which was midnight here in Sri Lanka, given the five-hour winter time difference between the two countries. Immediately afterwards, Kumar began getting calls from several of his friends in Paris, both French and Sri Lankan, who had caught the interview. "NRJ" is a French radio station, which broadcasts throughout Europe. Catering to a wide range of age groups and broadcasting a varied genre of music, NRJ's listeners have doubled and treble in recent years, making it one of the 'most listened to' radio stations both in France and Europe. Since the inception of TV Times, nearly five and half years ago Kumaradasa Wagista was the main contributor to the TV Times & Entertainment magazine mainly in the centrespread of the magazine . He was the veteran or more correctly the only film journalist in Sri Lanka. For the last 67 months he filled this centerspread without any hesitation or grumble . Writing about films and film personalities was his fonte. Today we carry the last story of 'Waki', as he was popularly known among his colleagues and also in the film scene . Waki died at the Sri Jayewardenepura Hospital on January, where he was admitted after suffering a heart attack. The news of Waki's death came to me as a shock. I met Waki about eight years ago , when he was running the show at the now defunct 'Windoor' magazine . Windoor was started by another veteran journalist Anton Gunesekera and subsequently was taken over by Waki when Mr. Gunesekara left the place after few months. Waki was a loveble charactor. Despite his age , he moved with everybody in all walks of life. Waki was not a fighter at all. But fights start always, when TV Times goes a 32 page bumper issue once a month. He used to give two or three extra stories for this big issue and always gets late as we advance the deadline . Thought I lose my temper most of the time , he was sure to keep cool and calm always a cracking joke , which were bit naughty ones. At the end, the goods were delivered and the pages were done . Knowing that there is no other jounalist in Sri Lanka, who could fill Waki's vaccum, TV Times will definitely go blank or more correctly I will go more helpless not knowing where to start . Thought he was labelled as film journalist , Waki was definitly more versatile than any known reporter. Colombo Municipality was not an office for him . MMCs and Officers were his friends and CMC was one of his homes outside home. Waki was one of the few journalists, who can write in English and Sinhala for their respective audiences. The most interesting transaction in his life I believe,was to throw his old typewriter for a Macintosh desktop. Not only he got used to the computer environment but mastered the machine in a very short time. Age was never a problem for Waki. Most of his office friends were young people and most of them were young girls. Whenever a new girl came to our office, Waki was sure to go and talk to them first while we were a bit reluctant to do the first move. Working and closely associating with all the beautiful actresses in the Sinhala film scene, Waki has the correct taste for the correct one. I am sure his family was lucky to have husband and a father like him. He was a true gentleman and an honest journalist . Waki never looked like a man who would die so suddenly. Sure we miss him but I will miss him more. The young actor talented enough to capture the attention of an audience Srinath Mahesh Maddumage says that family movies will never fail in giving good returns. Srinath who mesmerised millions of viewers as 'Vansanatha' in 'Nedayo' is now attracted by his role as a lorry driver in 'Mihimadala Giniganie'. "My enjoyment is the satisfaction I receive from what I do" he said. His entry into films and teleserial action was from the stage. As a student at Prince of Wales Moratuwa Srinath played in 'Monerawila',a school stage drama. "It was Tissa Gunawardena who gave me the encouragement and backing to play in this drama. I owe much to him. He is my mentor and guide in this field', Srinath said with gratitude to his teacher. As a youth Srinath has sacrificed many comforts in life due to his commitment to the drama and film acting fields. He has appeared in several dramas like ' Pandukabhaya', 'Duvili' and Anderala'. Presently he is rehearsing for another drama 'Padada Asapuwa' , a political satire written and produced by Sriyantha Mendis. "Like the saying it's not the length of the wand but the quality of the magic performed by the magician what matters, it's not the size of the role but how you play it is what actually matters"he said. Clearing a misunderstanding among youth that veteran actors in the field do not encourage or give a helping hand to new talents he said it's a canard. " No one can beat talent. One must be observant, intelligent and exercise endurance. This is what I have learnt as a drama and film actor" he added. Srinath won the best supporting actor award for his performance in ' Warrantuwa' by Parakrama Niriella and H. A. Perera. He is a Video Production co-ordinator at Alcohal & Drug Information Centre (ADDICT)." I am highly satisfied in my profession as it provides a service to the nation preventing youth from use alcohol and tobacco. We do propaganda work against the use of liquor and tobacco to save the youth from getting used to these vices which is both a strain on health and purse. Prevention is better than cure , is our slogan ".he said. Even the worse drunkard will not like his son consuming liquor or even smoking. According to a survey conducted by ADDICT women of detest men who are up to these two vices. Although he has played in many films his fans yet speak of the part he did in 'Gin avi and Gini Keli'. Among so far unreleased films where he has acted are Ask' Sand', 'Divine Ma', 'and 'Eleven Dawns' " I do not have any favourites. I treat all alike and they too are very good with me". He is one who doesn't believe in malice. He is confident that talent is recognised always. He wishes that more family films will be produced in the year 2000 so that more film goers would see them to better the film industry which is now facing a crisis. He is yet awaiting till he meets the correct partner for marriage. " I feel there is more time for marriage. Wedlock should not be a deadlock." he added. Srinath has a fairly large fan mail. He takes all efforts to reply his fans in spite of his heavy engagements. His address is 40/18, Park Road, Colombo 5.